The Highways England Incident Prevention Team (IPT) collaborated with WheelRight Ltd to assess how new technology could be used to tackle the problem. The Casualty Reduction Partnership is a multi-agency partnership which aims to reduce the number of people killed and injured in road traffic collisions. They organised a month-long series of events in their area directly communicating tyre safety to the public. Why did Highways England get involved? Concerned about the number of tyre-related incidents on the Strategic Road Network (SRN), the Highways England Incident Prevention Team (IPT) collaborated with WheelRight Ltd to assess how new technology could be used to tackle the problem. The IPT works to develop and implement initiatives aimed at reducing incidents that cause disruption to the SRN. It identified that tyre failures due to under-inflation are a major incident cause, and in some cases, can result in serious injuries or fatalities. Two testing areas (one for private cars and the second for commercial vehicles using technology provided by WheelRight Ltd were set up at Welcome Break’s Keele Motorway Service Area (MSA), M6 J14-15 Southbound to operate a tyre pressure technology pilot between April 2015 – December 2015. What did Highways England do? 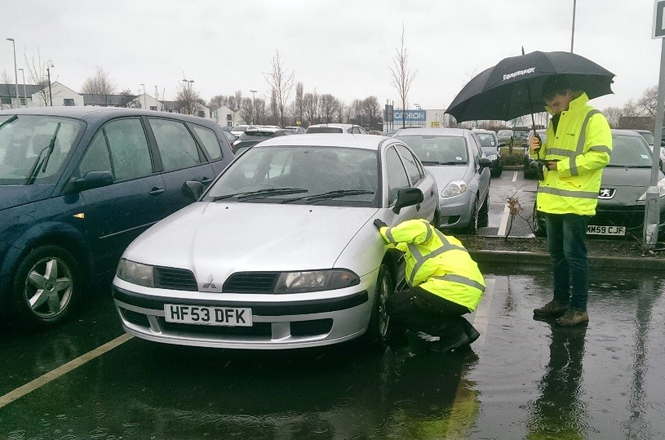 Customer education during the pilot was carried out by on-site Wheelright Ltd ‘ambassadors’ who used leaflets, surveys and informal conversations to raise awareness on the impact of correctly inflated tyre pressures on driving safety. Highways England Traffic Officers who supported the ‘ambassadors’ during the first stage of the pilot with great effect.WheelRight Ltd and Highways England also held regular briefing / demonstration events at Keele MSA. Attendees included RHA, FTA, CMPG, DVSA, Traffic Commissioners, Highways England Senior Management, Welsh & West Midlands Advisory Committee, Caravan Club. Tyresafe also supported the pilot in October 2015 as part of their ‘Safe tyres save lives’ campaign. The pilot ended on 31 December 2015 but collated data has provided valuable tyre pressure information and private/commercial vehicle driver reaction to using technology to measure tyre pressures. During the trial 30,967 vehicles completed the drive over (27,413 from cars & 3,554 from HGVs an average of over 800 vehicles per week of which 1 in 10 drivers were repeat users, ). During the demonstration 152,300 individual tyre pressure readings (109,652 cars and 42,648 HGVs) were measured without stopping a vehicle or removing a value cap. 1 in 8 tyres were more than 20% from their nominal pressure and 1 in 3 tyres were more than 10% from their nominal pressure. On average every second car had a dangerously under-inflated tyre. 1 in 12 tyres were more than 20% from their nominal pressure and 1 in 13 tyres were more than 10% from their nominal pressure. Driver feedback shows that drivers took action when the tyre pressure readings indicated an under inflated tyre and inflated their tyres using the on-site air compressors before leaving the MSA but these tyres are a potential trigger for an accident or incident.